There is probably no other wine more synonymous with California wine as California Zinfandels. Although we would probably get arguments from our Cab growing friends in Napa-Zinfandel really is a California favorite. Believed to have arrived to California in the 1860's, California Zinfandels have its roots (forgive the pun) down primarily the northern part of the state. You can still see some old vines (100+ years old) if you drive around wine country. All you really have to do is look for the gnarled, short and thick vines growing in the ground with no trellising…and voila, you've found old vines of California Zinfandel. In the 1860's and 1870's, Zinfandel was used primarily for blending into red table wine. It was also frequently "bulked out" to winemakers at a very inexpensive price. Some of the old wineries still have train tracks next to them where the tanker cars would come to get filled up with Zin juice. Many of the vineyards actually survived into the early 1900's and into Prohibition because many wineries turned to making "sacramental" wines for the churches-something still legal to produce during that time. Also, although commercial production of alcohol was prohibited, you could still make your own wine. Many of the vineyard owners would pick the grapes and sell them to home winemakers. During this time Zinfandel was one of the top five varietals produced in the state. Some wineries were producing Zinfandel by itself; bottling it as a single varietal instead of into a red table blend but that was not the norm. It was not until the 1970's that Zin got its big boom with a little wine called "White Zinfandel"…oh come on, no turning up your nose! White Zin is important in wine history as getting new people not familiar with wine to try something new-and it actually increased the production of Zinfandel grapes which led to increased bottling of the varietal on its own. We would not be where we are today in the world of Zinfandel if it were not for Sutter Home creating this wine. In the late 1970's and early 1980's Zinfandel becomes what we know it as today-a world class wine. Many wineries began taking a fine approach to producing Zinfandel giving it structure, complexity and character. It's hard to go wine tasting in California and not see Zin on the tasting menu. It has become California's darling wine. In fact, in 1998 50,000 acres of Zinfandel was planted in the state, making it the number one red wine varietal. 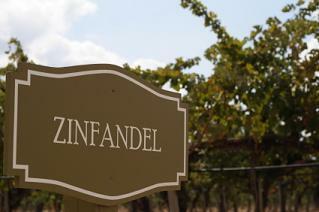 Today Zinfandel has a huge following in California and it's growing throughout the rest of the country. ZAP (Zinfandel Advocates and Producers) holds tastings that draw thousands of people to huge venues where it's nothing but Zinfandel as far as the eye can see. The society gets together and holds not only tastings but also educational seminars, food and wine pairings, classes and many other events. If you are a Zin fan, you should really check out this group and go to one of their tastings-it is a ton of fun. California Zinfandels have a range of flavors and styles. On one end of the spectrum you have the bright red raspberry, higher levels of acidity, cranberry, notes of spice and pepper and a lower alcohol level(around 13.5%). On the other end of the spectrum you have the deeper, darker, more ripe flavors of blackberry, berry jam, sweet dark fruit and a higher level of alcohol (16%+). Zinfandel is most noted for its fruity aroma-it shows off berry and red/dark fruits more than any other red wine…almost like standing next to a large patch of wild blackberries in the summer time. Another style of Zinfandel is to make it into a late harvest of port. The intense fruit nose just becomes intensified when made into a late harvest-lending itself well to be paired with a good dark chocolate. Some advice: if you have never tried late harvest Zinfandel, go out and get one. It is truly a treat! So, what Zins do you try if you are heading out to get a bottle? Wow, there are so many to choose from! Start by trying some of the more widely produced Zins and then moving on to smaller production wines from lesser known wineries. There is a saying about Zin in California as far as producers go: The three "R's" of Zinfandel. This refers to Ravenswood, Ridge, and Rosenblum-although some would argue that Renwood winery up in Amador County or Rafanelli winery in Dry Creek Valley should be included. As far as availability goes, these three producers are easy to find and are well known for their wines across the board. Try Zin from all areas of the state-they will all offer something different. One last thing to be aware of on the bottle: the term "old vine". There is currently no law specifying what exactly constitutes an old vine Zinfandel. Be sure to either look at the bottle to see if it states how old they are or if you are out wine tasting ask your wine server how old they are. Old vine wines offer a more intense Zinfandel flavor and are more expensive…but try to find something 50 years or older if you're looking for old vine Zin. Rosenblum Eagle Point Vineyard, Mendocino - A favorite from this producer. Raspberry flavors with a touch of oak, not overripe. Pairs well with food. Ridge Pagani Vineyard, Sonoma - Old vine with a great intensity and big flavor. Black cherry, cola, jammy fruit without being overripe. Turley Old Vine - Made by Helen Turley's brother, Larry. Famous cult producer of Zins. This wine is rich, toasted vanilla and berries make for a luscious, ripe treat. Pairs with cheeses, and perhaps on its own for dessert. Rafanelli, Dry Creek Valley - Another cult producer that is hard to find but worth the search. Notes of pepper, blackberry, raspberry and oak balance together to make a well-rounded wine that pairs exquisitely with food. Worthy of ageing. Seven Deadly Zins, Lodi - One of the best Zin finds in a value category. Bramble, vanilla, cherry, boysenberry are found in this wine. For the price, a great wine to drink any day of the week. Although this list barely scratches the surface, it's a starting point. Enjoy your own Zinfandel tasting journey!